On behalf of the people of Norway, H.M. King Olav V presented this memorial stone to H.M. King Carl XVI Gustaf on 14 June 1983. The memorial expresses Norway’s gratitude to Sweden for the equipment and training provided to 14,700 Norwegian military policemen – on Swedish soil – during World War II. 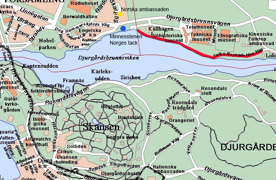 Nazi-Germany occupied Norway in the spring of 1940. In 1943 a secret Norwegian army began training in Sweden under the guise of being “police troops”. The first troops participated in the liberation of Finnmark and Kirkenes during the final winter of the war. When peace was declared in May 1945, the main body of troops marched into Oslo, Trondheim and Narvik, helping to secure a free Norway. Liberation Day is marked in Norway on 8 May, which is also Veterans Day. The memorial stone is also a token of gratitude to Sweden for its humanitarian assistance and its service as a place of refuge for approx. 60,000 Norwegian refugees. Count Folke Bernadotte’s efforts to rescue Norwegians from German concentration camps using white buses are yet another example of this solidarity. There were also relief efforts, focusing predominantly on Norwegian children and the elderly. These were conducted through Svenska Norgehjälpen, which became a popular movement. This aid comprised, among other things, 65,500 tons of food and donations equivalent to SEK 1.4 billion today. Norway’s deep gratitude for this relief effort was expressed in 1955 with the presentation to Sweden of the national gift Voksenåsen, today a well-established and spectacularly located Swedish-Norwegian cultural centre at the top of Holmenkollen in Oslo. On the initiative of Swedish-Norwegian Cooperation Fund, the memorial stone was moved on 29 May 2016 to its current site at Folke Bernadottes väg, close to the Royal Norwegian Embassy. The stone was originally installed outside the Nordic Museum. On presenting the memorial stone in 1983, H.M. King Olav V expressed the hope that the memorial stone “will stand as an enduring symbol of good relationships between neighbours in times of distress and as inspiration for future generations”. H.M. King Olav V was king of Norway between 1957 and 1991 and was married to Princess Märtha of Sweden, after whom the Norwegian church in Stockholm is named. The relocation of the memorial stone and to raise awareness of its history and purpose has been made possible thanks to financial support from Prins Carl Gustafs Stiftelse, private equity executive Björn Savén, Svensk-norska föreningen, Det Norske Samfund and Svensk-norska samarbetsfonden. Kungliga Djurgårdsförvaltningen has also contributed to the venture. H.M. King Olav V presenting the memorial stone to H.M. King Carl XVI Gustaf on June 14th 1983. 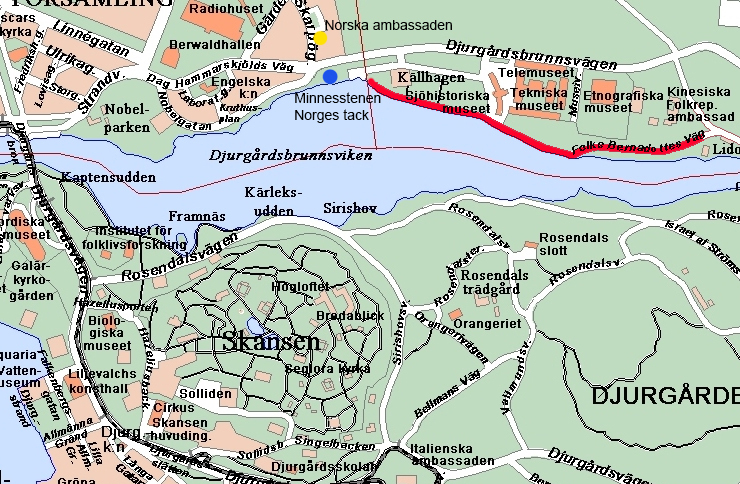 Folke Bernadottes Väg is located along Djugårdsviken and is marked red. The memorial stone is marked with blue color and the Embassy of Norway with yellow.